Summertime is ideal for cobblers because of all the fresh fruits and berries that are in season. I'm not just referring to the baked variety of cobbler either, the shaked variety is pretty awesome liquid refreshment on those warm evenings where you sit on the veranda to watch the fireflies and listen to the crickets and critters of the evening. 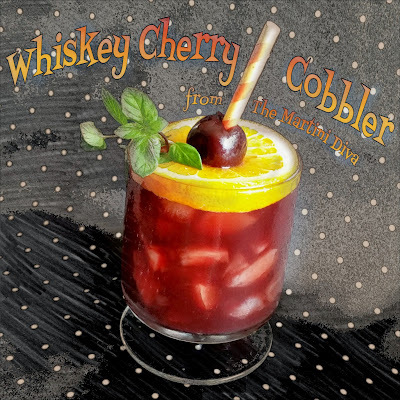 After giving a classic sherry based cobbler a whirl with my Berry Infused Sherry Cobbler, I thought a go at a whiskey or bourbon based cobbler might be interesting so I did a little Google research. I found an interesting recipe in Jamie Boudreau’s Whiskey Cobbler recipe over at Spirits and Cocktails but, since I had been using a lot of blackberries lately, I wanted to use a different fruit. Since May 17th is National Cherry Cobbler Day, I had a new bag of frozen cherries and I love cherries with bourbon, Mr. Boudreau’s lovely recipe gave me the ratios and my inspiration. I didn't have peach bitters so I used chocolate bitters plus just a dash of orange bitters as well to tie in the traditional slices of orange that are piled on top of a cobbler. I also replaced his plain simple syrup with homemade cherry simple syrup and used chocolate mint instead of the more common variety. And I opted for a soda free version because I was (OMG!) out of soda! Okay, I strayed a bit ... in fact I may have strayed out of a cobbler into a smash* when I dumped the soda ... but I'm keeping my fingers crossed that the esteemed Mr. Boudreau does not come over and beat me with a muddler. WHISKEY CHERRY COBBLER or maybe a Smash, but not a julep .... oh, hell, COCKTAIL! DIRECTIONS: Chill your glass in the freezer. (** If you plan on topping off with club soda use a Collins glass instead of an Old Fashioned glass.) Muddle the cherries and the quartered orange slice with the cherry simple syrup in the bottom of a cocktail shaker. Fill the cocktail shaker with ice cubes, pour in your whiskey of choice, add the chocolate and orange bitters and shake until well chilled. 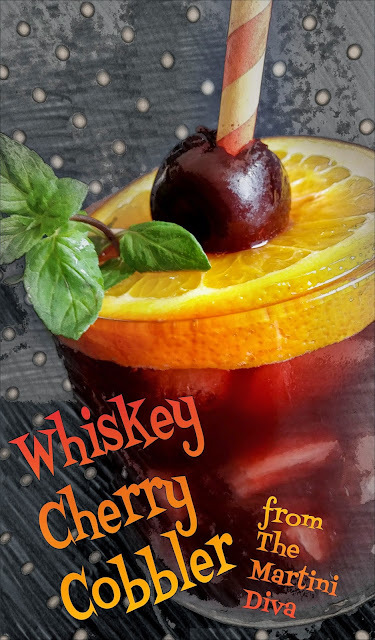 Fill your glass with cracked ice, strain the cocktail into your iced glass, top off with a splash of soda (if you're adding it) then garnish with the 2nd orange slice, a bourbonized cherry and a few sprigs of chocolate mint. Don't forget the straw! A little straw trivia: Before the invention of the paper straw in the late 1800's, barkeeps used actual pieces of straw and later pieces of hollow pasta, like vermicelli! * A cobbler (spirit, fresh fruit, sugar, soda) is a venerable, usually wine (sherry) based libation, kind of a second cousin to a julep (spirit, mint, sugar) and akin to a smash (spirit, mint, fruit, sugar). David Wondrich says, "A smash is a julep, but a julep is not always a smash." Yeah, with all the inventive mixology going on these days cocktail categories are a bit convoluted and confusing, but once upon a time there were rules.